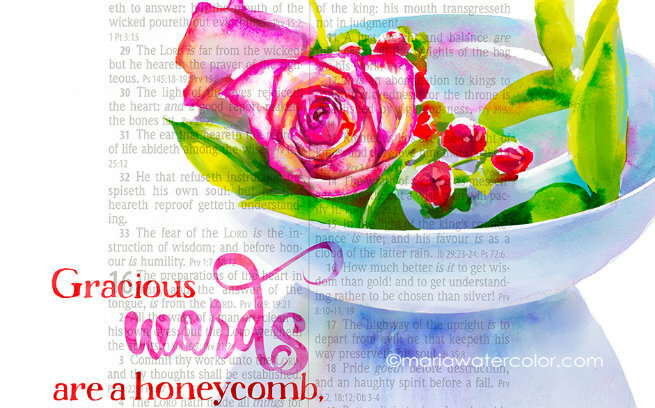 When we moved into our house I knew I wanted a bright, floral print with a Bible verse on it to go in my kitchen. I had a specific image in mind and I went straight to google and searched and searched until a beautiful watercolor print popped up. I clicked on it and it went to Maria Watercolor's website. 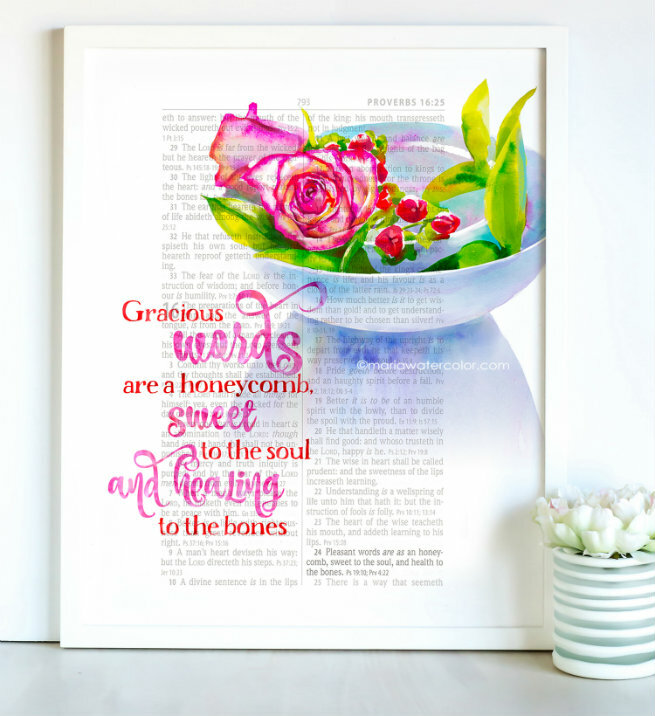 I instantly knew I wanted a Bible Watercolor Print from her shop. Her prints are amazing for so many reasons. The watercolor is beautiful and I'm a firm believer that putting God's Word, in a visual place around my home is important. Her artwork is printed on a KJV Bible page, which I think is really neat because that is the version I read. After contacting Maria we soon realized that we had a lot in common. We are both from Kansas, have both attended the same Christian college, and have both served abroad doing mission work. How neat is that? Maria's degree in commercial art has brought many opportunities for design work through the years, but she says her passion has always been portrait painting. While living in Paraguay for eight years, she sold more than 150 watercolor portraits of common people, such as street vendors and open-air market ladies. Now back in the States and raising her children in Kansas City, Kansas, Maria started an Etsy shop that features portraits with both hand- and digitally painted details. "Not even knowing it was a great idea, I started overlaying my watercolors on Bible pages." This new venture has generated significant interest in her shop -- in fact, quadrupling business in a matter of months. "More importantly, I'm spreading the Word of God, who is my first and greatest love," she adds. Maria maintains that the greatest blessing of this new professional endeavor is "just knowing that all my art experience, all my years teaching the Bible, and even all the hard times I've gone through are being channeled into these Bible Page prints, which are encouraging so many and bringing the Bible into homes in a fresh, lovely way." Maria also sells her beautifully designed art work in jewelry form as well as various Bible journaling resources. She just launched the sale of her journals and prayer journals and I will be adding one to my birthday list! They are so so beautiful. Her blog shares some helpful tips like how to manage stress or how to encourage and grow your little artist at home. 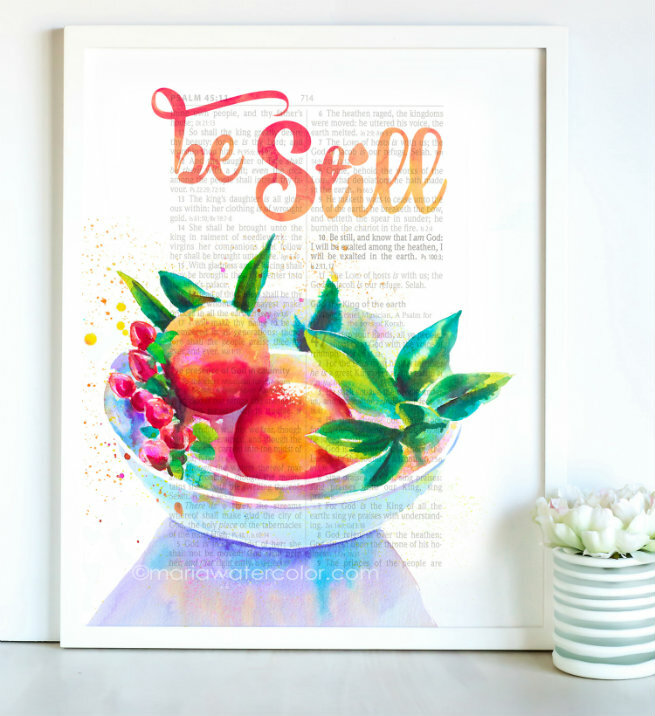 Today I'm partnering with Maria to give one of you a beautiful watercolor Bible print . We pray that it will be a blessing to you. Love her heart and ministry! These are beautiful! so, so pretty! i love the grace prayer journal kit she offers! Oh dang it! I totally meant to enter this. These are so, so pretty! I love the "Be Still" print. It's so cool they are printed on pages of the Bible. I need to save this shop for gifts! So pretty!!! I need to save her shop!